WASHINGTON — Republicans almost unanimously oppose spending $33.9 billion for extended unemployment benefits for some 2.5 million people who’ve lost them, because they say it would increase federal budget deficits. At the same time, they’re pushing a permanent extension of Bush administration tax cuts, especially for the wealthy, which could increase federal budget deficits by trillions of dollars over the next 10 years. How do they justify this? “Tax policy is dynamic. If you have the right kind of tax reform, it helps generate a more dynamic economy,” said Sen. Mike Crapo, R-Idaho, a member of the Senate Finance Committee, which writes tax law. While that may be true, even the Bush Treasury Department concluded that its tax cuts increase budget deficits. 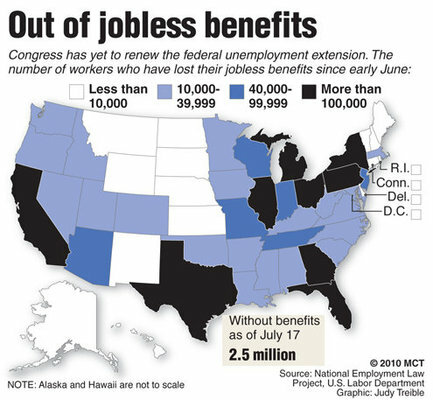 Besides, wouldn’t providing $33.9 billion to extend unemployment benefits to 2.5 million people help the economy? Democrats howl at what they see as hypocrisy. The GOP argument, said Sen. Tom Harkin, D-Iowa, is “that we should cut off some of the most desperate people in our economy, take away their last meager lifeline, because we’re concerned about the deficit. The money for jobless benefits is expected to win approval early next week after weeks of Republican-led extended debate. The next big economic-policy fight in Congress will involve the tax cuts, the 2001 and 2003 cornerstones of former President George W. Bush’s economic program. Most are set to expire Dec. 31, meaning that taxes on income, capital gains, dividends and estates would go up next year and the child care credit would be cut in half, to $500 per child. 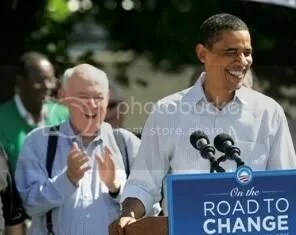 President Barack Obama would reinstate the top two pre-Bush marginal income tax rates of 36 and 39.6 percent, starting with adjusted gross incomes of more than $250,000 for joint filers and $200,000 for individuals. The current top rates are 33 and 35 percent. Obama would retain the Bush-era rates ranging from 10 to 28 percent for those who earn less. Congressional Democrats are weighing whether acting on taxes before the November elections would give them a political boost or instead give constituents troubled by record federal deficits more cause for concern. “We haven’t determined the timetable” for considering tax cuts, said House Majority Leader Steny Hoyer, D-Md. Conservatives contend that tax policy should be considered differently from spending. Taxes spur the economy, their thinking goes, because the more consumers spend and invest, the more businesses will hire and the more the economy will grow. Reducing tax revenue, they claim, will force spending restraint on Congress. On the other hand, they say that extending unemployment benefits without offsetting revenue doesn’t appreciably boost the economy and could weaken jobless workers’ incentive to seek new employment. Liberals, boosted by a report earlier this year from the nonpartisan Congressional Budget Office, maintain that the jobless benefits go to those who need them most and are likely to spend them quickly, and that multiplies their economic effect. The CBO and Congress’ Joint Committee on Taxation said earlier this year that extending the original Bush-era tax cuts would increase budget deficits by $2.56 trillion during this decade. Deficits under Obama’s budget plan are expected to total about $9.75 trillion over the next 10 years. Other tax experts say the government should tax the wealthy at higher rates so that some wealth can be redistributed to those who may need aid, the traditional progressive taxation principle that guides U.S. tax law. Top Republicans in effect admit that they don’t care about deficits in pushing to keep the tax cuts. Nobel Economist Paul Krugman’s latest commentary reinforces much of the above. See what Senators Saxby Chambliss, Jon Kyl, and Mitch McConnell say in support of tax cuts. What are they likely really after? It’s described as starving the beast. Well – number 3 is possibly dumber than the first two. We’re paying people NOT TO WORK, and doing so for 99 weeks!!! That is insane. Every study ever done on ending unemployment shows that most of those people will go back to work – maybe not in a job they want, but they will find a job! I am a perfect example. I got laid off in 2007 from a high paying job in my field. I immediately found a telephone sales job (about 2/3 reduction in salary) with a commission upside. The work was beneath my education and training, but I went to it and succeeded, and was able to keep my family above water. I did it because the money was still better than the unemployment (though not by much), and i will never take a handout. In a state like California, this doesn’t work anyway, it’s too expensive to live here. Nevertheless, I know way too many people who are turning down multiple opportunities to work in any capacity. They want the same job/wage they used to have, and think taking a “fill in job” will hurt their resume, or just be beneath them. Miraculously, those people actually find jobs within 2 to 3 weeks of their unemployment running out. Paying people not to work increases the deficit, and it exacerbates that problem when they are not generating tax revenue through working to pay some of that back. This should be obvious. And where does that unemployment money come from? My wife and I are living on the tightest of tight budgets. Even though I recently found a good job again, we have a lot of savings to make up for, and we’re living very tightly. Now I’m faced with a $2000-$3000 California tax increase thanks to the Stupid Global Warming Bill that California just passed, and the stupid “school bond” that our city passed. We can’t afford that, and now OUR MONEY will also be taken to give to people who ARE NOT WORKING again! This is intolerable, enrages me, and makes it harder for my family to live. Throw in my unborn son due Feb 2011 and my costs are about to rise again. I want to pay for my son’s needs, not your needs if you are one of the people who is sitting on your duff collecting a paycheck and not working. That is not only my opinion, it’s my reality. And it is un-American and selfish of people to do that knowingly. It’s well known, Freedomhawk, the for every available job there are five people waiting in line. So your notion of the unemployed refusing to work simply doesn’t hold water. Since it doesn’t, then it does serve the overall economy to pay them benefits, since not to do so would decrease aggregate demand and thus increasure unemployment even more. Jobs are created by mass demand, not primarily by the wealth of rich people. The consumer demand coming from them is relatively small, and persists in any case. We can cut taxes to zero and eliminate all regulations, and it won’t create a single job. Ask any businessman which he’d rather have first, a customer with a purchase order or a tax cut. It’s a no brainer. But when workers don’t have money to spend, we need the government to deliver the purchase orders for the things that make for productive investment, infrastructure, schools, pulic utilities and the like. If you don’t buy my view, just watch. The neoliberal fat cats are going to shove your view down the throats of all of us to enrich themselves even more. They are already awash with cash, and if I were you, I wouldn’t hold my breath waiting for a surge in employment. It’s more war and more austerity on the horizon for all of us.